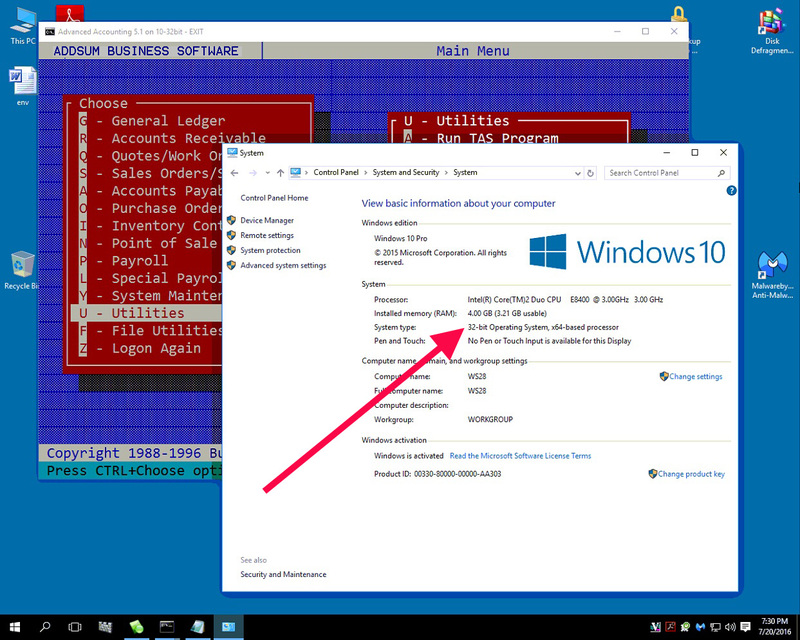 Addsum Business Software, Inc.: Will Advanced Accounting 5.1 run under Windows 10? Postings here will focus mainly on Advanced Accounting software updates, tips, and related topics. They will also include general comments relating to troubleshooting PC/Windows/network problems and may also include reference to our other software products and projects including any of our various utilities, or to the TAS Premier programming language. We considered setting up separate blogs for different topics so that users/others could subscribe to topics mostly aligned with their interests, but decided that it would be better to keep things simple since some topics cross over into others. We would nonetheless welcome your feedback/input in this regard. Our web site URL is www.addsuminc.com. Call us at 800-648-6258 or 801-277-9240. We also maintain www.advancedaccounting.us so that older Business Tools users in particular have a greater chance to find us. We highly recommend that accounting software users "follow" this blog via e-mail (enter your address and click on Submit below) or subscribe to a feed (see also below) as a way to keep current on the latest updates and accounting software news and information. You may also want to whitelist this e-mail address: noreply@blogger.com. Will Advanced Accounting 5.1 run under Windows 10? As long as you use the 32-bit version of Windows 10, yes, it will. An Adv 5.1 system running under Windows 10. Screen shot taken on July 20, 2016. Will we support this 1996 version of the software running like this? Of course!